When you want the most intense sexual pleasure possible (and what guy doesn't) you need the "Double V" system! This duo of revolutionary sexual enhancement products is designed to work at the body system level and deliver targeted results where you need them most. The result is a whole new level of sexual enjoyment, passion, and satisfaction for you and her. The two products that make up the "Double V" system are fantastic on their own, but when taken together they work synergistically to reignite the fire you may have thought was extinguished for good AND make your erections (and performance) even more impressive. The first part of the "Double V" system is Virectin, a leading, all-natural male enhancement product that represents a combination of ancient tradition and modern scientific knowledge. Using the highest quality herbs and an advanced, patent pending extraction process, we've managed to create a male sexual performance product that is powerful, quick-acting, long-lasting, and completely safe. 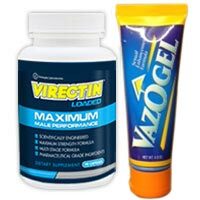 Vazogel also acts as a silky lubricant to eliminate the passion-killing problem of friction. It's totally different than those gunky creams and heavy oil-based products you may have tried in the past. Vazogel is 100% edible and has a pleasant taste…it's up to you to decide what to do with that information! Imagine the possibilities when you use this potent combination of products known as the "Double V" system! Heighten sexual sensation for you and your partner, increase sensitivity, maximize your orgasmic capabilities, and improve your stamina so you can make her moan again and again… it's all possible with the "Double V" system! Place your order today to unleash your sexual powers. And remember…the "Double V" System is 100% GUARANTEED… there's nothing to lose…but you have size and the adoration of your completely satisfied partner to gain! (Click Here To See Complete Ingredient Information) We carefully selected each ingredient in to maximize immediate and long term benefits to your sexual health. To ensure you get strong, consistent results each and every time we use potent, pharmacy grade standardized herbal extracts. This means we know the exact strength of the active compounds in each and unit of Vazogel is of exactly the same strength and purity. Vazogel contains no chemically generated compounds, fillers or artificial additives. We use only the finest GMP laboratory certified ingredients in their highest concentrated and digestible levels.